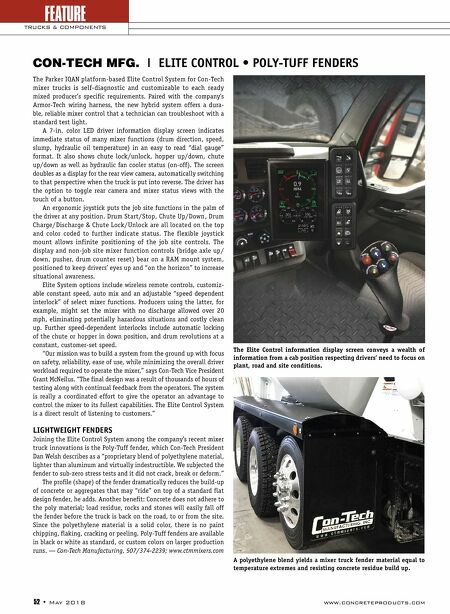 52 • May 2018 www.concreteproducts.com FEATURE TRUCKS & COMPONENTS The Parker IQAN platform-based Elite Control System for Con-Tech mixer trucks is self-diagnostic and customizable to each ready mixed producer's specific requirements. Paired with the company's Armor-Tech wiring harness, the new hybrid system offers a dura- ble, reliable mixer control that a technician can troubleshoot with a standard test light. A 7-in. color LED driver information display screen indicates immediate status of many mixer functions (drum direction, speed, slump, hydraulic oil temperature) in an easy to read "dial gauge" format. It also shows chute lock/unlock, hopper up/down, chute up/down as well as hydraulic fan cooler status (on-off). The screen doubles as a display for the rear view camera, automatically switching to that perspective when the truck is put into reverse. The driver has the option to toggle rear camera and mixer status views with the touch of a button. An ergonomic joystick puts the job site functions in the palm of the driver at any position. Drum Start/Stop, Chute Up/Down, Drum Charge/Discharge & Chute Lock/Unlock are all located on the top and color coded to further indicate status. The flexible joystick mount allows infinite positioning of the job site controls. The display and non-job site mixer function controls (bridge axle up/ down, pusher, drum counter reset) bear on a RAM mount system, positioned to keep drivers' eyes up and "on the horizon" to increase situational awareness. Elite System options include wireless remote controls, customiz- able constant speed, auto mix and an adjustable "speed dependent interlock" of select mixer functions. Producers using the latter, for example, might set the mixer with no discharge allowed over 20 mph, eliminating potentially hazardous situations and costly clean up. Further speed-dependent interlocks include automatic locking of the chute or hopper in down position, and drum revolutions at a constant, customer-set speed. "Our mission was to build a system from the ground up with focus on safety, reliability, ease of use, while minimizing the overall driver workload required to operate the mixer," says Con-Tech Vice President Grant McNeilus. "The final design was a result of thousands of hours of testing along with continual feedback from the operators. The system is really a coordinated effort to give the operator an advantage to control the mixer to its fullest capabilities. The Elite Control System is a direct result of listening to customers." LIGHTWEIGHT FENDERS Joining the Elite Control System among the company's recent mixer truck innovations is the Poly-Tuff fender, which Con-Tech President Dan Welsh describes as a "proprietary blend of polyethylene material, lighter than aluminum and virtually indestructible. We subjected the fender to sub-zero stress tests and it did not crack, break or deform." The profile (shape) of the fender dramatically reduces the build-up of concrete or aggregates that may "ride" on top of a standard flat design fender, he adds. Another benefit: Concrete does not adhere to the poly material; load residue, rocks and stones will easily fall off the fender before the truck is back on the road, to or from the site. Since the polyethylene material is a solid color, there is no paint chipping, flaking, cracking or peeling. Poly-Tuff fenders are available in black or white as standard, or custom colors on larger production runs. — Con-Tech Manufacturing, 507/374-2239; www.ctmmixers.com CON-TECH MFG. | ELITE CONTROL • POLY-TUFF FENDERS The Elite Control information display screen conveys a wealth of information from a cab position respecting drivers' need to focus on plant, road and site conditions. 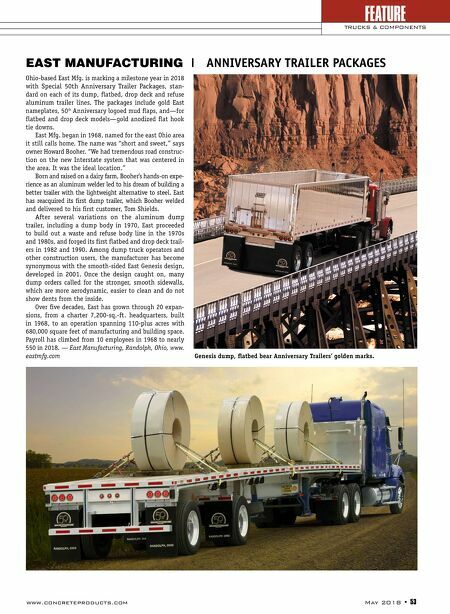 A polyethylene blend yields a mixer truck fender material equal to temperature extremes and resisting concrete residue build up.